I’m sorting through beetle specimens collected from Iqaluit, Nunavut today. Say it with me now: “EWWWWWWWWWW“. 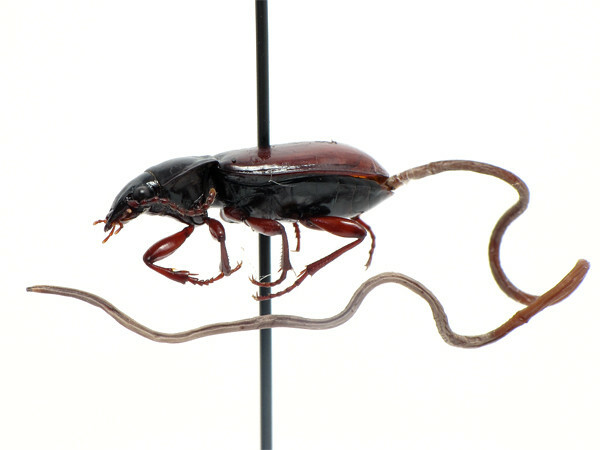 This poor ground beetle (family Carabidae) has been parasitized by a nematode-like worm called a hairworm, or “Gordian worm”, (Gordiaceae: Nematomorpha). Adult hairworms are free-swimming, water-dwelling animals (either in fresh or salt water). They mate and produce young (larvae) in the water. The larvae require two hosts. First they infest various small arthropods (called paratenic hosts), like mosquito larvae. Next, those small paratenic hosts are consumed by other, larger arthropods – ground beetles fit the bill since they are heavy-bodied, voracious predators. 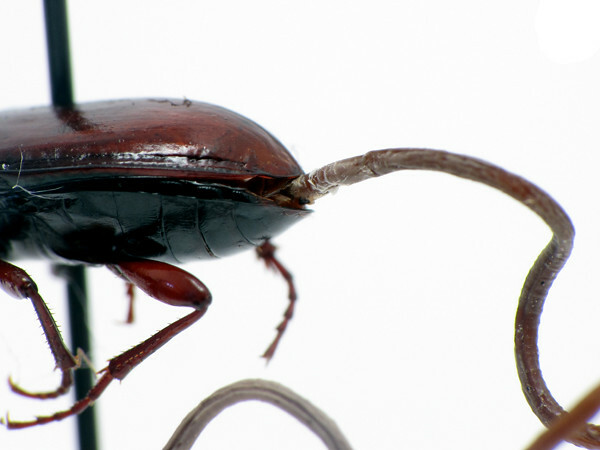 Worldwide, at least 70 species of ground beetles are known to be hosts for hairworms. When the worm is mature, it has to leave its host and return to the water to reproduce. If it has infested an aquatic insect, it has no trouble making its way back to the water. However, if it has chosen a terrestrial insect as a host, things get a little more complicated. Like so many parasites, the hairworm can use a type of mind-control to affect the behaviour of its host. In this case, it compels the terrestrial beetle to seek out water, then drown itself. Yikes! For this beetle, which I caught in a yellow pan trap, I can envision one of two scenarios: 1) the worm was mature, and convinced the beetle to take a dip in the preservative fluid in the trap, or 2) the beetle just happened to wander into the trap, and the worm decided to abandon ship. Whatever happened, it was not a happy “ending” for either animal! 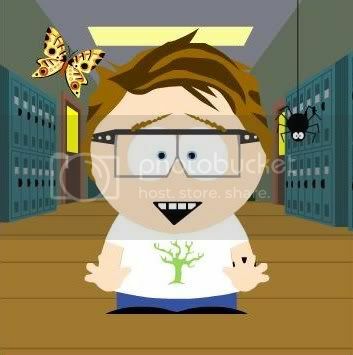 I selected this post to be featured on my blog’s page at Nature Blogs. I skipped right over “EWWWWWWWWWW” and went directly to “COOL!”. Hmm, maybe all those ground beetles in your samples are feeding on fly larvae and other aquatic/semiaquatic inverts that wouldn’t end up in your traps (that is, if you’re still allowed to discuss your research publicly :)). I actually wondered that, Ted, after doing some research on these worms this afternoon (I knew nothing about them before today). Another excellent possible avenue to explore!!! “Not a happy ending.” Good one! Wow! (hey…I’m old school!) What a great find. It’s amazing the beetle could survive at all with that size of worm inside them. Ha ha ha! Not a happy ending… Love it. If you dissect it out you might be able to identify it. It is probably a Gordius sp.- they are know for infecting Carabidae. Fantastic worms. They are my absolute favorite and I’m always on the hunt to find them when it rains. I’d like to try to get an ID. I’m hoping that the nematode guys at the Canadian National Collection might be able to help me with it. I actually stuck this one (and another I found later today) back in ethanol just in case. I’m pretty sure I’ve never actually seen one of these before. Either that, or I just didn’t know where to look, or what it was I was seeing. I’ll be more aware now, for sure! Thanks for stopping by and commenting! AHHH so much worm for so little body. I can’t wait to see how much MORE worm there is in there, bwahahahahaha!!! Does it remain in the aquatic (mosquito larva) host until it matures and leaves the water in order to be consumed by a terrestrial predatory beetle? It’s cool how it makes the beetle to it to water! I’m not entirely sure, to be honest, but I wonder if it can’t be both? I know that the secondary host can either be aquatic (which could easily consume an infected primary host in the water) or terrestrial, as in this case. I’m having a hard time envisioning a beetle snagging a fast-moving, wriggly little mossie larva out of the water, so I wouldn’t be surprised if the encysted parasite larvae can persist in the adult form of the primary host – in which case there would be a very interesting link between aquatic and terrestrial food webs going on. I honestly didn’t know anything about these worms before yesterday, though, so don’t quote me on any of that (it’s just my own guesses) – I will be looking into this further, though! I’m definitely EWWWWing. When I saw this at BugGirl’s Blog I thought it was some kind of abstract beetle art. Now I am squirming (and feeling sorry for any drowned carabid mites). yikes! makes me concerned for the cats’ tapeworms. Mind control is an appealing explanation but has this been proven experimentally? I wonder if any method of asphyxiation would cause the worm to abandon ship… If mind control is at work – is the motivation for the beetle seeking water thirst or suicidal aspirations? How would you discriminate these options? Thans for sharing! I’ll have to dig up the specific sources, but actually both of those hypotheses have been proposed: i.e., thirst resulting from dessication due to the feeding of the parasite, or chemical or other cues transmitted by the parasite to modify the behaviour (as has been seen in many, many other arthropod parasite-host relationships). That said, there is a fairly big behavioural difference between approaching water to drink, and putting one’s body IN water at the risk of drowning (which seems to be what happens) – this latter scenario seems unlikely to happen if thirst was simply the case. That said, how would I test these? I can envision a lab-based experiment with several treatments: 1. a control (beetles, lab-reared, with no parasite, access to water, but not standing water (i.e. a moist cotton ball); 2. no parasite, restricted water; 3. parasite, access to water; 4. parasite, no water. Control the food available to the beetle. Control the temperature and ambient humidity. Keep under these conditions for X amount of time (until the worm would be mature, I’m not sure how long that would be but I suspect not very long, weeks or a couple of months at most). Then provide a source of standing water. Observe and record 1. time to approach water 2. does the beetle simply drink or does it enter the water 3. mortality – when, and in water or out of water 4. signs of worm emergence (in or out of water) 5. I’d haul them out after they died and determine moisture content too probably…I could think of a few more. This would be pretty challenging, though, because you’d have to feed the beetles known infected intermediate hosts. This is all just off the top of my head but with some tinkering I’m pretty sure you could tease out whether thirst alone, or simply the presence of the parasite, was the reason for the “swim”. It would be a great little project!